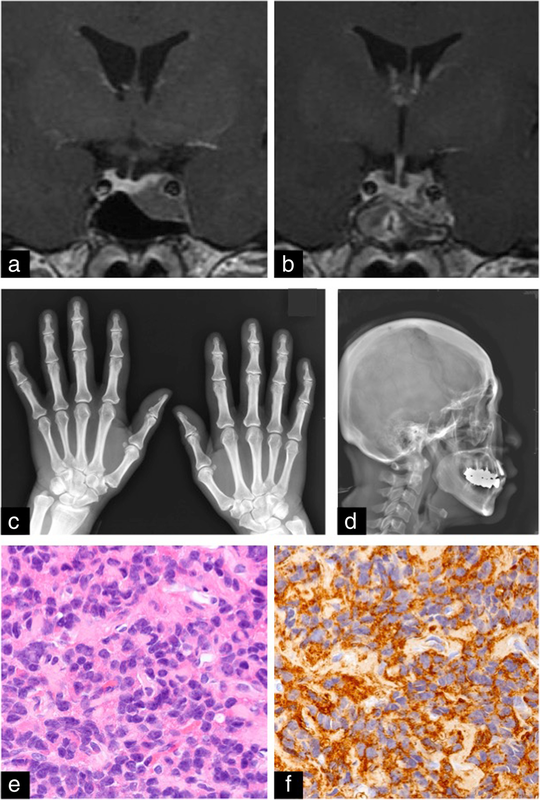 Clinically silent somatotroph adenoma is characterized by elevated serum growth hormone but without the clinical symptoms of acromegaly, and it is considered rare. The natural history is not well understood, progress to symptomatic is uncertain, and treatment strategy has not been established. 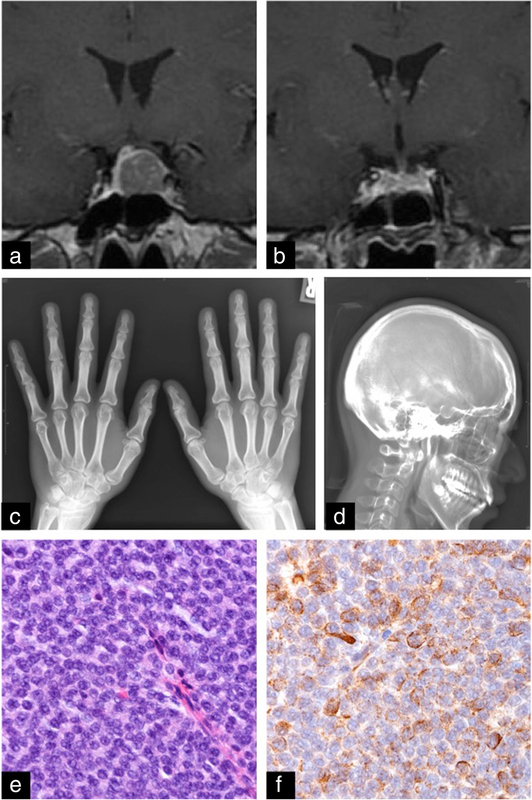 The first patient was a 48-year-old-Asian woman who presented with serum growth hormone 6.99 ng/ml and insulin-like growth factor 1 of 476 ng/ml, but no characteristic features of acromegaly. Five years after initial diagnosis, she presented with acromegalic facial appearance. Transsphenoidal surgery achieved gross total removal and endocrinological remission. The second patient was a 40-year-old-Asian woman who presented with serum growth hormone 31.14 ng/ml and insulin-like growth factor 1 of 709.6 ng/ml, but no characteristic features of acromegaly. Three years after initial diagnosis, she presented with acromegalic facial appearance. Transsphenoidal surgery achieved gross total removal and endocrinological remission. The third patient was a 64-year-old-Asian woman who presented with serum growth hormone 6.0 ng/ml and insulin-like growth factor 1 of 341 ng/ml, but no characteristic features of acromegaly. Eight months after initial diagnosis, hand enlargement was detected. Transsphenoidal surgery achieved gross total removal and endocrinological remission. Due to its potential for evolving to symptomatic disease, the risks of surgery and observation for patients with somatotroph adenoma should be carefully compared from the viewpoint of better health outcome. Somatotroph adenoma is defined as a pituitary neoplasm characterized by unregulated growth hormone (GH) hypersecretion. Typical features such as acral enlargement and coarse facial features identify patients with somatotroph adenomas, leading to a diagnosis of acromegaly. Such patients present with several coexisting clinical conditions, including hypertension, cardiovascular diseases, abnormal glucose tolerance, obstructive sleep apnea, and malignant neoplasms such as colon and thyroid cancer [1, 2, 3, 4, 5, 6, 7, 8]. Without treatment, their mortality rate is high compared with the general population . Consequently, early surgical intervention is recommended. Recently, somatotroph adenomas have been classified according to pathological GH expression and excessive serum GH levels. Adenomas with positive immunohistochemical staining for GH but no elevation of serum GH concentration are considered to be “silent” somatotroph adenoma. Similarly, “clinically silent” adenomas are defined as GH-secreting tumors with elevated serum GH concentration, but without the clinical manifestations of excess GH . 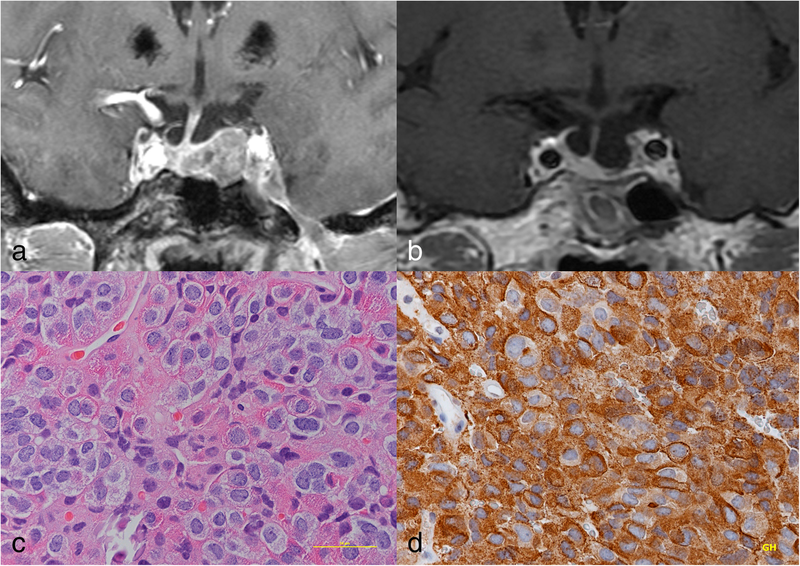 This entity of clinically silent somatotroph adenoma is now recognized, but whether clinically silent adenoma will become symptomatic remains uncertain, so no treatment strategy has been established. We treated three patients with somatotroph adenomas without signs of acromegaly despite elevated serum GH concentration. They developed acromegalic features during follow-up for small sellar tumors and later underwent surgery leading to disappearance of the tumors. We discuss the validity of early surgery for such patients. Informed consent was obtained from all individual participants included in the study. A 48-year-old-Asian woman visited the neurosurgical department of another hospital because of chronic mild headache. Head magnetic resonance (MR) imaging incidentally detected a small mass lesion inside the sella turcica. Endocrinological examination showed high concentrations of serum GH (6.83 ng/ml; normal range, 0–2.47 ng/ml) and insulin-like growth factor 1 (IGF-1) (517 ng/ml; normal range, 82–219 ng/ml). Because she had no neurological deficit or medical history of hypertension and diabetes mellitus, surgery was not proposed at the former hospital, and simple observation was continued. She had no family history of cancer or endocrinological diseases. She occasionally drinks alcohol and has no smoking habit. She worked as a school janitor, and a routine medical checkup showed that her systolic and diastolic blood pressure were around 110 and 70 mmHg, respectively. During the follow-up period, head MR imaging showed no significant change in tumor size, and concentrations of serum GH and IGF-1 were not further increased (6.99 ng/ml and 476 ng/ml, respectively). Five years after the initial diagnosis, baseline blood pressure was elevated to 140/80 mmHg. She had an 8-kg weight gain, and her shoe size was enlarged by 1.5 cm during this period. Finally, she was referred to our department for surgical intervention. Head MR imaging showed that the tumor was slightly enlarged (11 × 16 × 16 mm) and sparsely enhanced with gadolinium (Fig. 1a). On admission, prominent forehead, prominent lower jaw, and bite abnormalities were not observed. A roentgenogram showed cauliflower-like enlargement of the distal phalanx of the fingers (Fig. 1c). The expansion of maxillary or frontal sinus was not particular, but enlargement of the nose and lips was evident (Fig. 1d). Serum concentrations of GH (7.33 ng/ml) and IGF-1 (606 ng/ml) had further increased. A preoperative 75-g oral glucose tolerance test (OGTT) showed no suppression of serum GH concentration. To control excess GH secretion, surgery was proposed. Transsphenoidal surgery achieved gross total removal of the tumor (Fig. 1b). Serum concentrations of GH (1.89 ng/ml) and IGF-1 (422 ng/ml) had rapidly decreased by 1 week after surgery and remained at low levels at 4 months after surgery (GH, 2.91 ng/ml; IGF-1, 339 ng/ml). Postoperative 75-g OGTT showed sufficient suppression of serum GH concentration. She was discharged without neurological deficit. After surgery, the heel pad thickness was decreased by 1 mm, and body weight was decreased by 2.9 kg. The head MR imaging, serum concentration of GH, IGF-1, and 75-g OGTT were followed up for 21 months after surgery, which revealed no evidence of recurrence. Postoperative histological examination of formalin-fixed, paraffin-embedded tumor specimens demonstrated sheet-like proliferation of monomorphic round cells with H&E staining (Fig. 1e), and tumor cells showed diffuse immunoreactivity for GH (Fig. 1f). The histological diagnosis was densely granulated somatotroph adenoma. A 40-year-old-Asian woman visited another general neurosurgeon’s clinic because of chronic mild headache. Head MR imaging incidentally detected a small mass lesion inside the sella turcica. She had no family history of cancer or endocrinological diseases. She has no smoking or drinking habit. She worked as an administrative staff member of an office and had no irregular educational and environmental histories. She had no neurological deficit or medical history of hypertension and diabetes mellitus. Endocrinological examination showed high concentrations of serum GH (11.90 ng/ml; normal range, 0.28–1.64 ng/ml). Because she presented no clinical features of acromegaly, the initial diagnostician did not propose surgery, and simple observation was continued. During the follow-up period, head MR imaging showed no significant change in tumor size, and concentration of serum GH was not further increased (10.10 ng/ml). Three years after the initial diagnosis, radiography showed that the tumor had enlarged, and the patient had weight gain and foot size increase. She accepted surgical treatment and was referred to our department. Preoperative MR imaging showed the tumor with suprasellar extension (14 × 19 × 12 mm), and the optic chiasm was slightly compressed upward (Fig. 2a). On admission, prominent forehead, prominent lower jaw, and bite abnormalities were not observed. Roentgenogram showed cauliflower-like enlargement of the distal phalanx of the fingers (Fig. 2c). The expansion of maxillary or frontal sinus was not particular, but enlargement of the nose and lips was evident (Fig. 2d). Serum concentrations of GH (31.14 ng/ml) and IGF-1 (709.6 ng/ml) were further increased. Preoperative 75-g OGTT showed no suppression of serum GH concentration. To control excess GH secretion, surgery was proposed. Transsphenoidal surgery achieved gross total removal of the tumor (Fig. 2b). Serum concentration of GH (0.98 ng/ml) and IGF-1 (407.8 ng/ml) had rapidly decreased by 1 week after surgery and remained at low levels at 4 months after surgery (GH, 0.62 ng/ml; IGF-1, 207.9 ng/ml). Postoperative 75-g OGTT showed sufficient suppression of serum GH concentration. The patient was discharged without neurological deficit. After surgery, the heel pad thickness was decreased by 2 mm, and body weight was decreased by 4.0 kg. The head MR imaging and serum concentration of GH and IGF-1 were followed up for 66 months after surgery, which revealed no evidence of recurrence. Postoperative histological examination of formalin-fixed, paraffin-embedded tumor specimens demonstrated sheet-like proliferation of monomorphic round cells with H&E staining (Fig. 2e), and tumor cells showed patchy immunoreactivity for GH (Fig. 2f). The histological diagnosis was sparsely granulated somatotroph adenoma. A 64-year-old-Asian woman visited the neurology department of another hospital because of chronic mild headache. Head MR imaging incidentally detected a small mass lesion inside the sella turcica (Fig. 3a), and she was referred to our department. Serum concentrations of GH (6.00 ng/ml) and IGF-1 (341 ng/ml) exceeded the normal ranges, but she had no neurological deficit or medical history of hypertension and diabetes mellitus, and no physical characteristics of acromegaly. She had no family history of cancer or endocrinological diseases. She has no smoking or drinking habit. First, she refused surgery, but 8 months after the initial diagnosis, she accepted intervention. She was a homemaker and had no regular work. She requested the shortest hospital stay and did not agree to the preoperative 75-g OGTT. Preoperative MR imaging showed a slightly enhanced tumor without particular enlargement (11 × 17 × 17 mm). Acromegalic hand enlargement was discovered at the time of surgery. To control excess GH secretion, surgery was proposed. Transsphenoidal surgery achieved gross total removal of the tumor (Fig. 3b). Serum concentrations of GH (0.85 ng/ml) and IGF-1 (104 ng/ml) had rapidly decreased by 1 week after surgery and remained at low levels at 4 months after surgery (GH, 1.76 ng/ml; IGF-1, 174 ng/ml). Postoperative 75-g OGTT showed sufficient suppression of serum GH concentration. She was discharged without neurological deficit. After surgery, her body weight was decreased by 0.5 kg. The head MR imaging, serum concentration of GH, IGF-1, and 75-g OGTT were followed up for 23 months after surgery, which revealed no evidence of recurrence. Postoperative histological examination of formalin-fixed, paraffin-embedded tumor specimens demonstrated sheet-like proliferation of monomorphic round cells with H&E staining (Fig. 3c), and the tumor cells showed diffuse immunoreactivity for GH (Fig. 3d). The histological diagnosis was densely granulated somatotroph adenoma. Clinically silent somatotroph adenoma was first described in 1985 . Since then, several case reports and case series have been published [10, 12, 13], but this entity is still considered rare. Recently, one-third of somatotroph adenomas were reported as clinically silent, a relatively higher incidence rate than previously believed . However, the natural history of this entity is still unknown. Clinically silent somatotroph adenoma may be biologically active with the potential to become symptomatic . Our series illustrates the natural course of the disease and confirms this potential. Long-term exposure to excess GH in patients with definitive acromegaly might be associated with the development and progression of comorbidities such as hypertension, diabetes mellitus, cardiovascular diseases, and certain cancers, so early diagnosis and early treatment are recommended to reduce the risk of premature death [15, 16]. However, no treatment strategy has been established for patients with clinically silent somatotroph adenoma, because the risk of clinical symptoms is uncertain. Consequently, surgery for these patients is prophylactic and is only justified if the surgical risk is lower than the risk of simple observation. Morbidity and mortality associated with surgery are decreased if the surgeon has experience of more than 200 procedures . Our institution is a high-volume center for transsphenoidal surgery. The operator (Y.O.) has performed more than 1000 procedures, and the outcomes for the three cases presented here were acceptable. For our patients, medical therapy was a considerable option. Several medicines, such as dopamine agonists or somatostatin analogues, have been advocated, and preoperative medical therapy has been considered useful to obtain enhanced extent of surgical resection and better biochemical remission [18, 19, 20, 21]. If the initial diagnostician had chosen medical therapy, our patients possibly could have avoided having acromegalic symptoms. However, the primary mode of therapy for patients with acromegaly is surgery because of better remission rate. Unfortunately, neither surgery nor medical therapy was chosen as an initial treatment for our patients because of patient-related and/or diagnostician-related reasons. To achieve better biochemical remission, surgery should be considered for these patients at the time of initial diagnosis with small sellar mass. This case series has several limitations. First, the clinical manifestations were initially judged by neurosurgeons. An experienced endocrinologist might have detected subtle features of acromegaly. Second, this report is a three-case series and does not assess the actual rate of evolution to symptomatic disease. Moreover, surgery was performed after symptom onset, so the efficacy of early intervention was not fully addressed. Surgery is prophylactic, so the relative advantages and risks of surgery and simple observation must be considered carefully. Although somatotroph adenomas lack the characteristic feature of acromegaly at initial diagnosis, there is a possibility of evolving into symptomatic disease. Further investigation with larger series and longer follow-up is needed. 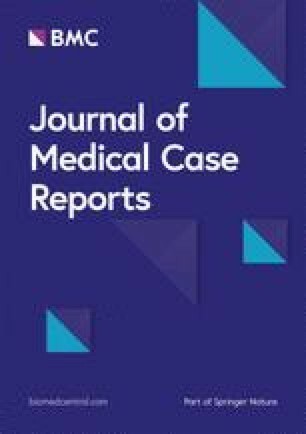 Because this manuscript is a case report, there are no datasets which could be freely available to use supporting the conclusions of this article. TK analyzed the patient data regarding the endocrinological outcome and was a major contributor to the writing of the manuscript. YO performed tumor removal all through the investigated period. TT initially raised the question and essential suggestion and supervised this manuscript. All authors read and approved the final manuscript. The surgical policy was explained preoperatively to the patients and written informed consents were obtained. Overall study design was approved by the Ethical Committee of Kohnan Hospital 2017.